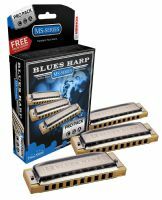 Blues Harp MS. Dark, Dirty, Hard Rockin' Sound. The preeminent harp on the market designed for blues music, this harp is engineered for consistent volume and tone when used for intense blues playing. In contrast to other Marine Band models, where the tonal range is simply extended upwards, this interesting model designed by highly regarded harp player and author Steve Baker features a tonal range which is extended downwards.